The Army Reserve Officers' Training Corps (ROTC, AROTC, or SROTC) is the United States Army component of the Reserve Officers' Training Corps. It is the largest ROTC program, with 20,000 ROTC cadets in 273 ROTC programs at major universities throughout the United States. These schools are categorized as Military Colleges (MC), Military Junior Colleges (MJC) and Civilian Colleges (CC). The modern Army Reserve Officers' Training Corps was created by the National Defense Act of 1916. This program commissioned its first class of lieutenants in 1920. However, the concept behind ROTC had its roots in military training which began taking place in civilian colleges and universities as early as 1819 with the founding of the American Literary, Scientific and Military Academy at Norwich, Vermont, followed by various state chartered military schools and finally civilian land grant colleges after the Civil War, which required military training. For a cadet who takes only the first two years of ROTC (Basic Course), there is no military obligation, unless the student is a 3–4 year scholarship cadet or has other specific scholarships. If a cadet has accepted a scholarship, service commitments may vary. With some exceptions, in order to progress to the last two years of the program (Advanced Course) the cadet must contract with the United States Army. To do so, the student enlists in the United States Army Reserve Control Group (ROTC) as a cadet and elects to serve on either active duty or in a reserve component (Army National Guard or Army Reserve). The following is an outline of a general military science program. A student who does not meet all of the above requirements should consult with the Department of Military Science and Leadership to determine if waivers can be granted. This year serves as the cadets' first introduction to the Army. Topics covered include military courtesy, military history, basic first aid, basic rifle marksmanship, basic hand grenade use, land navigation, rappelling, fundamentals of leadership, map orienteering, field training and drill and ceremony. The second year is an expansion of the topics taught in the first year of the program. Cadets are introduced to tactics, troop leading procedures, basics of operations orders and ethics. Basic Camp, formerly Cadet Initial Entry Training (CIET) and Leader's Training Course (LTC) before that, is a four-week (28-day) introduction to Army life and leadership training of the ROTC, held at Fort Knox, Kentucky each summer. The aim of this training is to motivate and qualify cadets for entry into the Senior ROTC program. Basic Camp is a summary version of the first two years of leadership development training that cadets receive at their university for the basic course. This course is designed for college students, either in the summer between freshman and sophomore year or between sophomore and junior year, qualifying these cadets for enrollment in the Military Science III year and Advanced Course. The course sequence in this year is mainly focused on the application of leadership and small-unit tactics. Cadets are assigned rotating leadership positions within the School Battalion and are evaluated on their performance and leadership abilities while in those positions. Third-year cadets practice briefing operations orders, executing small-unit tactics, leading and participating in physical training and preparing for successful performance at the four-week Cadet Leader Course during the summer following the third year. Under current regulations, attendance at the course is mandatory (in the past, Ranger School was offered as an alternative to select cadets). During MSIII year and continuing through Advanced Camp, cadets are introduced to the Leadership Development Program (LDP). The LDP is a structured set of rotations where MSIII cadets are assigned to specific roles in an organization consisting of companies, platoons and squads. Some of the roles traditionally filled are that of a company commander, company XO, first sergeant, platoon leader, platoon sergeant and squad leader. While filling these positions, the MSIII is evaluated according to the Army Leadership Requirements Model (ALRM) which centers on what a leader is (attributes) and what a leader does (competencies), outlined by the following model. The evaluation is usually given by an MS IV and is delivered in writing using a Developmental Counseling form, DA 4856. Cadets are counseled on their performance through the ALRM attributes and competencies. At the end of the MSIII school year, these counselings are collected and help determine a cadet's Order of Merit (OML) during branching. Advanced Camp is a paid four-week leadership course conducted at Fort Knox, Kentucky each summer. It was formerly conducted at Fort Lewis, Washington, Fort Bragg, North Carolina and Fort Riley, Kansas. In 2014, Advanced Camp (then LDAC) was consolidated with Basic Camp at Fort Knox, Kentucky. This was a period of upheaval for the training event due to the rapid change of locations and new Cadet Command Commanding General stripping Advanced Camp of its graded portion. For 2014, Advanced Camp, then LDAC, retained its graded portions, but in 2015 it was changed to Cadet Leadership Camp (CLC). During the time it was called CLC, all the graded portions of were taken out and the 4 week period was pass/no pass. In 2016 a new commanding general took over Cadet Command, on his first day CLC became Advanced Camp and in 2017 the old style of graded events will be brought back. This includes a graded PT test, graded rifle qualification and graded training lanes. Typically, cadets attend Advanced Camp during the summer between their first and second years in the Advanced Course (junior and senior year of college). At Advanced Camp, cadets take on various leadership roles and are evaluated on their performance and leadership abilities in those positions. Cadets also participate in adventure training to include: confidence and obstacle courses, rappelling, water safety, weapons firing and patrolling. While at Advanced Camp, cadets take a series of standardized tests including the Cadet Development Assessment (CDA). The CDA assesses the state of a MSIII cadet's development in preparation for the MSIV year with a focus on mission-context problem solving. Cadets must attend and complete Advanced Camp to earn an Army commission. This is the final year of the ROTC program and the main focus is towards preparing cadets to become successful lieutenants in the Army upon graduation and commissioning. Senior cadets apply for their branches (career fields). Senior cadets apply before end of their third year, but have until mid September to make any changes before they are locked in. In early November, cadets are notified of which branch and status they were granted (e.g., Regular Army, Army Reserve, Army National Guard). 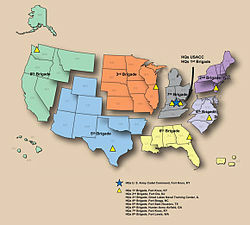 For those cadets selected for the reserve component (Army Reserve or Army National Guard), they are responsible for locating a unit with which to serve. Cadets selected for active duty (Regular Army) are notified of their first duty assignment in the spring semester, typically in early April. Throughout their senior year, MSIV cadets are assigned cadet battalion staff positions and are responsible for evaluating MS III cadets, planning and coordinating training operations and missions. The primary purpose of the MSIV year is to learn how to manage and evaluate training in the field while learning officership in the classroom. Leadership labs place cadets in leadership positions, teach and provide practical experience in military drill and ceremonies, troop leading procedures, small unit tactical operations, rappelling and water survival. Labs are held during the week and run for approximately two hours. Physical fitness training builds physical conditioning, teamwork, and self-confidence. Physical fitness training sessions are scheduled for one-hour and the intensity, time and type of exercises varies. All ROTC students must complete the Army Physical Fitness Test (APFT) with at least the minimum (60%) in each of the three categories according to their age bracket (see Army Physical Fitness Test). Also each battalion may make its own standards. For example, a battalion may set a standard of scoring no less than 70% (10% more than the Army requires) in each category. Failure to reach the battalion standard may require increased physical fitness training on days of rest (commonly known as "incentive or remedial PT"). ROTC cadets must train for the military at the same time that they complete their college degree. This entails numerous commitments during and outside the school year. 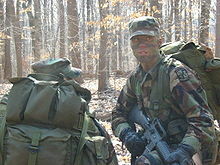 Cadets are typically (situation may vary in military colleges) mandated to wear military uniforms to college classes one day per week, take military science as one of their regular course requirements, attend physical fitness training during the week and participate in several field training exercises on weekends. The summers following cadets' sophomore and junior years typically involve training courses at Fort Knox, at a time when other students typically pursue internships or research opportunities. The cadre at each university consist of military personnel and civilian technical assistants who run the ROTC program. It is the cadre's job to teach and oversee the day-to-day operations of the ROTC program. Every Army ROTC program has a professor of military science, usually a lieutenant colonel; it is his/her job to instruct the MSIVs as they make the transition from cadet to second lieutenant. The United States Army offers ROTC scholarships that assist students with financing their education. There are three different types of scholarships available to high school students. These scholarships are won through the national ROTC scholarship selection board which convenes on three different dates that vary slightly each school year. Four-year scholarships offered to candidates pay for full tuition for all four years of their undergraduate degree. Three-year advanced designee scholarships require students to enroll in a college ROTC program and be a full-time college student, for which the student's freshmen year will not be paid for by the Army. If the student displays academic competence and receives a recommendation by the program's Professor of Military Science, the remaining three years will be paid for in full. Two-year scholarships are known as Early Commissioning Program scholarships, or Ike Skelton scholarships. These scholarships enable a student to commission into the Army Reserves or the Army National Guard in two years instead of the usual four. Students are required to attend a Military Junior College for two years and will commission after. As students will have an associates rather than the required bachelors for the Basic Officer Leaders Course, students will have up to three years to earn their bachelors and are eligible for the Educational Assistance Program which can pay for up to two years of tuition. If students wish to go Active Duty on the ECP route, they will have to do so through their respective MJC. ROTC scholarships for those already attending college will cover the remaining years of their college. The three-year scholarship is available for students who have three academic years of college remaining. The two-year scholarship is available for students who have two academic years of college remaining. The Army ROTC scholarship entitles its recipients to full-tuition assistance, as well as a textbook/fee allowance and a monthly stipend to cover the student's living expenses. Typically, cadets receive tuition assistance. However, they also have the option to apply the scholarship to their 'room and board' expenses instead of school tuition. The Simultaneous Membership Program (SMP) is an alternative route to receive military scholarship benefits. The program requires cadets to enlist in a reserve unit (Army Reserve or National Guard) while enrolled in ROTC. ECP cadets are required to enlist in the Army Reserves or the Army National Guard during their two years at a Military Junior College, and will be in the SMP program. SMP cadets are not required to complete Basic Combat Training (BCT) or Advanced Individual Training (AIT), but it is necessary to receive specific benefits. The benefits are as follows. Once contracted, SMP cadets cannot be deployed. However, they are required to attend all drill events with their unit. This includes drill weekend and advanced training. Cadets may compete for training opportunities conducted at active army schools. This training is usually conducted during the summer months, but some allocations are available during the winter holidays. Cadets are selected to attend this training based on their overall standing within the program. Since the number of allocations are limited, selection for schools is competitive and based on factors including ROTC grades, academic grades, participation in ROTC activities, APFT scores and advisor recommendations. Cadets are trained in airmobile operations, including rappelling from helicopters, airmobile tactics and rigging air mobile cargo. This is a two-week course taught at Fort Campbell, Kentucky. Upon successful completion, the cadet is awarded the Air Assault Badge. Army airborne training is conducted for three weeks at Fort Benning, Georgia. Upon successful completion, cadets are awarded the Parachutist Badge. This is a 4-week program of instruction executed by the United States Military Academy to develop the leadership skills of sophomore cadets. Seven weeks of CFT will be at Camp Buckner, New York. CFT consists of basic skill level training ending with Maneuver Light Training during which the cadets train on how to defend and attack an opposing force. An initiative of ASA/MRA, allows cadets to work with Department of the Army (DA), the Office of the Chief of the Army Reserve (OCAR), National Guard Bureau (NGB) or the Office of the Secretary of Defense (OSD) for 3 weeks. Cadet Troop Leadership Training is an optional program for MSIII cadets during the summer following completion of LDAC. This three week CONUS or 4 week OCONUS program trains cadets in lieutenant positions with active army units. Assignments are available in nearly all branches and with units worldwide. Drill Cadet Leadership Training is very similar to Cadet Troop Leadership training but it takes place at Fort Jackson, South Carolina. During the three weeks, cadets will follow around drill sergeants and the officers of each basic training company. The Northern Warfare Training course is a three-week course covering tactical operations in a cold weather climate. The course is taught at Fort Greely in Alaska. Cadets are trained in winter survival techniques, skiing, snowshoeing and cold weather patrolling. The Army Mountain Warfare course is taught at the Ethan Allen Firing Range in Jericho, Vermont. It is taught in two phases, each lasting two weeks. The summer phase teaches and tests cadets on military mountaineering operations including rock climbing, rappelling and orienteering. The winter phase teaches and tests on similar tasks, but in the winter environment. It includes ice climbing, cross-country skiing and cold weather operations. The Sapper Leader Course focuses on the application of a mixture of infantry and combat engineer small unit tactics to forces composed of one or more branch of service. Additionally, this course focuses on advancing the leadership skills of its students within these environments. The course is taught in two sections which each focus on different tasks. The first consists of general information including combat lifesaving, meeting physical fitness standards, demolitions, explosive hazard recognition, land navigation, knot tying, as well as air, mountain and water operations training. The second phase consists of tactics which relate specifically to patrolling and combat operations with topics covering movement formations, intelligence gathering, planning operations, MOUT, and a field training. The course as a whole lasts for 28 days. Phase one makes up the first thirteen days of training while phase two training takes up the remaining 15 days. Of these last 15 days, the field training exercise takes 9 to complete. To be accepted into the program, a prospective student must show proficiency in multiple areas of physical fitness, as well as knowledge of battle drills. To meet the minimum physical standards, a candidate must pass the APFT as well as the height and weight measures. Additionally, the results of the Combat Water Survival Test are required. All training is conducted on the U.S. Army installation of Ft. Leonard Wood, Missouri. On graduation, successful students will be awarded the sapper tab. 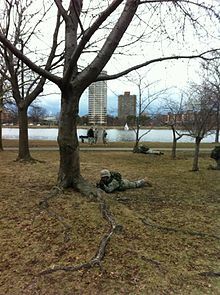 For ROTC Cadets, participation in the Robin Sage exercise is the opportunity to train in guerilla tactics with Special Forces candidates conducting the exercise. During the training, cadets act as a guerrilla force in Pineland, a fictional independent state which has been invaded, who are trained by special forces candidates. The training opportunity covers a variety of battle drills all focused around fieldcraft for small units. Some general items such as operations planning, medical procedures, troop movements and demolitions are among the more prominent skills taught in this environment. The exercise encompasses 20 days of training. For ROTC Cadets, selection for training is dependent upon performance academically, and physically. The training is conducted in the civilian areas around Ft Bragg, North Carolina. During training, the 15 counties in central North Carolina are used to represent the independent state of Pineland. For ROTC candidates, no awards are received as this is part of a training exercise and not an independent school. Ranger Challenge is the varsity sport of Army ROTC. A Ranger Challenge team is made up of 9 people, 8 active participant and 1 reserved. They compete against other colleges throughout the nation in events such as patrolling, weapons assembly, one-rope bridge, Army Physical Fitness Test, land navigation and a ten kilometer road march. This is both a physically and mentally grueling competition. A color guard is responsible for posting the colors for ceremonial events (football games, dining ins and dining outs, military balls and commencements), as well as cannon detail at football games, in order to show honor towards flag and country. These formal social events are designed to allow cadets to experience the type of social gathering and military etiquette they can expect as future commissioned officers. Cadets are encouraged to bring spouses/dates. Many dignitaries are invited, including the school president, certain university officials and representatives of veterans' societies, parents and relatives. The Creed is recited at all dress functions usually following the playing of "The Star-Spangled Banner". I am an Army cadet. Soon I will take an oath and become an Army officer committed to defending the values which make this nation great. I understand mission first and people always. I am the past, the spirit of those warriors who have made the final sacrifice. I am the present, the scholar and apprentice Soldier enhancing my skills in the science of warfare and the art of leadership. But above all, I am the future, the future warrior leader of the United States Army. May God give the compassion and judgment to lead and the gallantry in battle to win. In 1960, General George H. Decker became the first ROTC graduate named Chief of Staff of the Army. General Colin Powell was the first ROTC graduate named Chairman of the Joint Chiefs of Staff, who was a graduate of the City College of New York and later served as the United States Secretary of State. The Citadel has produced 293 general and flag officers as of 30 June 2017. VMI had produced 265 as of 2006. The University of Oregon has produced the highest number of general officers out of the civilian ROTC schools, with a total of 47. Outside these, cadets are eligible for numerous U.S. Army awards and decorations, as well as awards and decorations sponsored by various military societies and organizations. Cadets who demonstrated academic and leadership excellence can be designated as distinguished military student (DMS) or distinguished military graduate (DMG). ^ Although General of the Army George C. Marshall, Chief of Staff of the Army during WWII, was a graduate of the Virginia Military Institute, he technically received a direct commission, since the modern-day ROTC program had not officially been established when he graduated. ^ "Army Regulation 145–1 Senior Reserve Officers' Training Corps Program: Organization, Administration, and Training" (PDF). U.S. Army. U.S. Army. p. 6. Retrieved 1 August 2017. ^ "U.S. Code Title 32 CFR 110.4 - Responsibilities". U.S. Federal Government. Cornell University Law School. Retrieved 1 August 2017. ^ "About Basic Camp (CIET) – Basic Camp". ^ U.S. Department of the Army. Army Leadership. Army Doctrine Reference Publication. 14-16. Washington, DC: U.S. Department of the Army, September 10, 2012. ^ "Scholarships for Students & Enlisted Soldiers". ^ "Simultaneous Membership Program - National Guard". ^ "Documents". www.wood.army.mil. Sapper Leader Course. Retrieved 26 April 2017. ^ "SAPPER LEADER COURSE PAMPHLET" (PDF). armyrotc.mst.edu. US Army. February 2010. Retrieved 26 April 2017. ^ "SAPPER Leader Course". goarmy.com. US Army. Retrieved 26 April 2017. ^ "Robin Sage exercise set". www.army.mil. U.S. Army John F. Kennedy Special Warfare Center and School Public Affairs. 7 July 2015. Retrieved 26 April 2017. ^ Chung, Alex. "Robin Sage Training Opportunities | Army ROTC | Marquette University". www.marquette.edu. Retrieved 26 April 2017. ^ "RPI Army ROTC". rpi.edu. Retrieved 21 April 2016. ^ "Brigades". U.S. Army Cadet Command. U.S. Army Cadet Command. Retrieved 1 August 2017. ^ Citadel, The. "Distinguished Alumni - General and Flag Officers". www.citadel.edu. The Citadel. Retrieved 6 July 2017. ^ "Alumni". VMI Profile. VMI. 2006. Archived from the original on 24 October 2006. Retrieved 20 November 2006. ^ "University of Oregon ROTC History". University of Oregon Army ROTC. University of Oregon. 2006. Retrieved 20 November 2006. ^ "CCR 672-5-1". Cadet Command Awards Matrix. Department of the Army. Archived from the original on October 17, 2003. Retrieved 29 January 2009. ^ "Cadet Awards on rotc.wustl.edu". ^ "Army Regulation 145–1 Senior Reserve Officers' Training Corps Program: Organization, Administration, and Training" (PDF). U.S. Army. pp. 37–38. Retrieved 1 August 2017. This page was last edited on 14 December 2018, at 16:42 (UTC).